When we think of the current political aspect of the country, the most important obligation for the incumbent government elected by the people is to fulfill the people’s desires and necessities. International circle in addition to the people of Myanmar are watching the transitional measures struggled by the incumbent government amidst the insufficiencies and slew of requirements in every front. 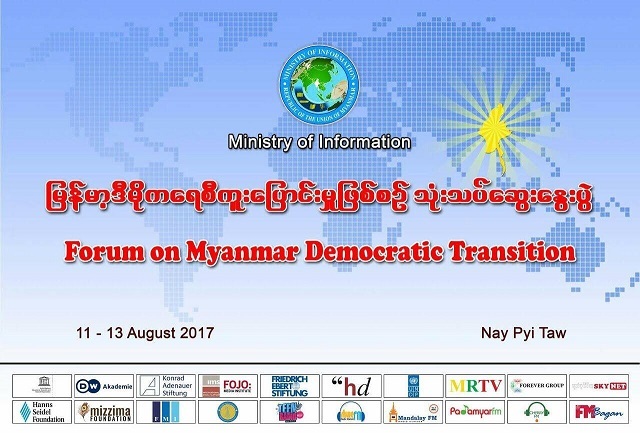 The Forum on Myanmar Democratic Transition will be held at Myanmar International Convention Center 2 (MICC2) in Nay Pyi Taw from 11-13 August to discuss the matters concerning with the government’s successful deal on difficulties and snags encountered during one and half year of their reign, challenges in transition and review of the past works for future program. State Counsellor Daw Aung San Suu Kyi will deliver the opening speech at the forum, it is learnt. According to the headings the past experiences of overcoming the difficulties in transitional process, requirements to be fulfilled, present setbacks and preparatory works for the future will be known to all participants and audience. The desires of the people and the extent of transition will also be revealed from the forum. In the 3 day-forum 13 foreign professionals, 24 local intelligentsias, representatives from 3 pillars and foreign Ambassadors will take part in the forum. Among the external professionals, Mr. Michael Vatikiotis, a writer who wrote the books on transition and is the expert in theory of transition and Lt. General Agus Widjojo who has got wide own experience in transition of Indonesia. Among other participants are Prof. Dr Aurel Croisannt, Prof. Dr Andreas Oberheitman who will discuss the transition from centralized economy to market economy, Mr. Christophoros Politis who will discuss the relationship between military and civil institutions, Director General of Information Department of Srilanka, Mr. ranga Kalansooriya, Mrs. Dunja Mijatovic, Mr. Kavi Chongkittavorn and Ms. Isabella Kurlowski who will discuss the role of media in transition. Local participants are National Security Advisor U Thaung Tun, Deputy Minister U Aung Htoo, Deputy Minister U Set Aung, and Members of Parliament U Lwin Ko Latt, U Pyone Cho, U Phyo, U Zayar Thaw, U Aung Kyi Nyunt, Daw Zin Mar Aung, Col. Aung Myint Oo, U Aung Kyi, Dr Hlan Hmon Sar Khaung, U Kyaw Lin Oo, U Lay Nyunt, Dr Than Myint Oo, U Thein Wai, Daw Khin Ma Ma Myo, U Myo Myint, Dr Thein Swe, U Aye Maung Kyaw, Daw Janan Larhtaw, U Aung Hla Tun, U Tin Maung Than, U Soe Myint and Daw Thin Thin Aung. The way to discuss in this forum is so arranged as to bring out the assessment on real situation, suggestions for transition, approach to transition from different angles and the experience of transition from other countries. Furthermore, the arrangement can also bring in the experts who are well- versed with theory of democratic transition and also the professionals who had their own experience in transition. The arrangement also includes discussion with exchange of views on all 6 headings made by local professionals from each pillar. Final session of the seminar will see the conclusions and result on each heading after thorough discussion among the participants. Responsible personnel from Hluttaw, personnel from the departments of the ministries, Chief Ministers and Ministers of Region/State, Ambassadors from foreign Embassies, Myanmar-based international organizations, local social organisations, internal/external media and 100 observers, total 450 persons will attend the forum. People, government, institutional pillars and various organisations are now marching together on the road of transition and their stances, policies, ways of approach will be taken into discussion in this forum with deliberation on present situation, setbacks of the past and aspiration for future. Now our country could have shown the world that Myanmar could transform to a democratic country but with different underlying conditions from others. Therefore, this transformation may be called a new form deviated in some ways from others in the world. The participants from local and abroad will take part in discussion in this forum with analytical comparison with the transition of other countries. The transition in present Myanmar is so replete with high expectations and aspirations of the people that the other countries become interested in Myanmar. The present forum is expected to find out the solutions to the problems and challenges encountered in the way of transition in which the government has tried to meet the desires of the people who conferred the mandate to change the country by voting. 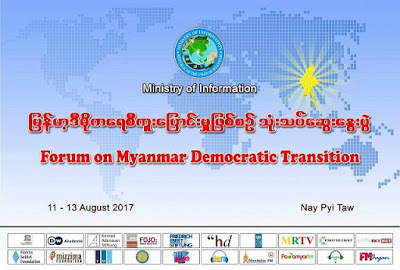 In other words, It is expected the discussion and assessment on the present transition with global overview in this 3-days Forum will beef up the momentum of the democratic transition of the country and in some ways will contribute to the successful democratic transition of Myanmar.